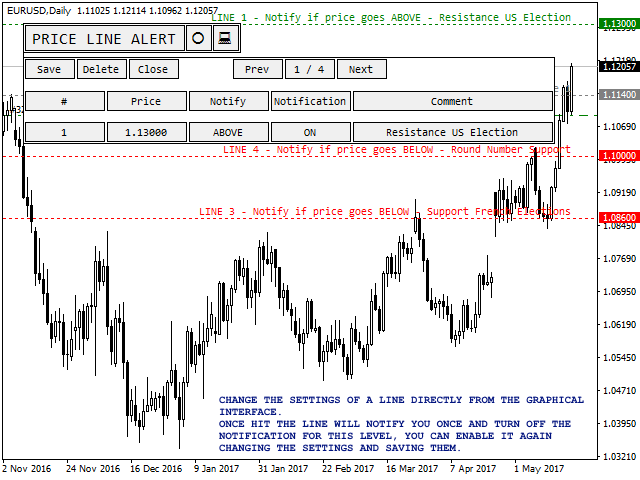 The Price Line Alert Indicator will allow you to set price level that will alert you when hit, the price level will be shown in the chart as lines. Useful to get notified at specific prices, support, resistance, round numbers and so forth. You can set several Price Lines and configured them to notify you if the price goes above or below them. 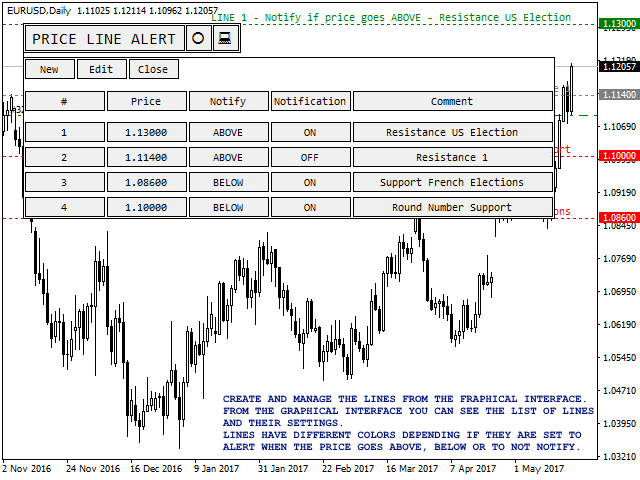 These Price Lines can represent significant level of support, resistance, round numbers or levels that you consider important. Select the initial options when loading the Indicator, colors and positions, notification options. Create the levels with the graphical interface, set the price, the type of level and if notify or not. Once a notification is triggered for a line this will not notify again unless you set manually to notify again. The Price that will trigger the Levels is the BID. 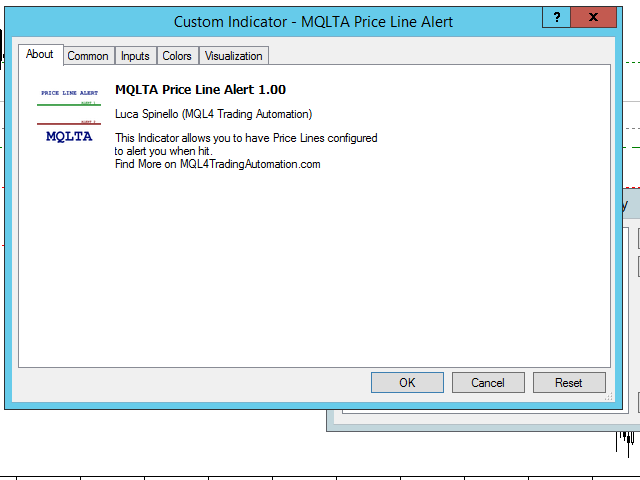 Why you should use the Price Line Alert? You should use this indicator to get notified when price levels for you important are hit. 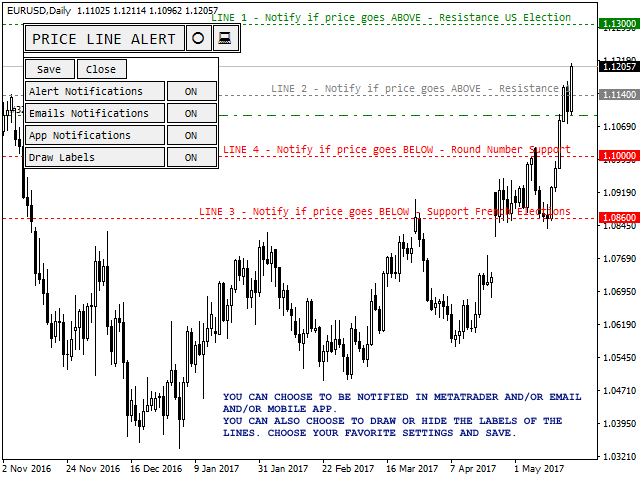 This free indicator will not allow you to close automatically open orders but if you need this function and you don't want to use the visible STOP LOSS and TAKE PROFIT level please try https://www.mql5.com/en/market/product/23113. Objects Prefix (used for the panel) - Prefix for the created graphical objects, suggested to leave default. Alert Sound (wav in the Sounds Folder of MetaTrader) - the file name of the sound to play during the alert. Inactive Line Color - the color of the disabled lines. 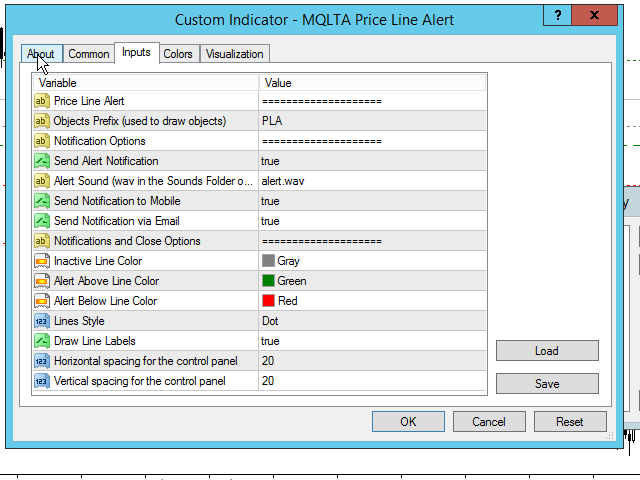 Alert Above Line Color - the color of the lines that will alert when the price is above them. 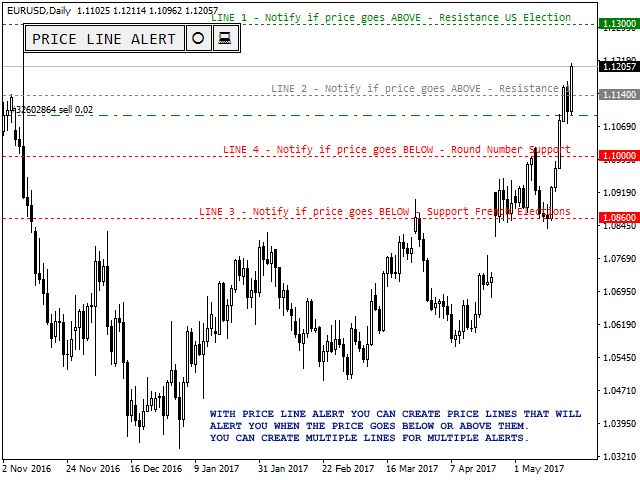 Alert Below Line Color - the color of the lines that will alert when the price is below them. Line Style - the style of the line. Draw Line Labels - to chose is drawing or not the labels of the lines. Horizontal offset (pixels) - horizontal spacing of the panel from the border. Vertical offset (pixels) - vertical spacing of the panel from the border.